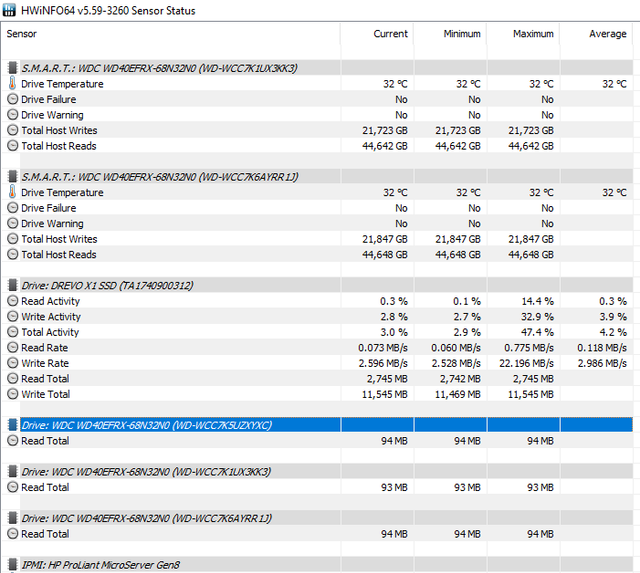 I own 3 WD Red series 4TB drives (WDC WD40EFRX-68N32N0), but since a few weeks ago HWiNFO stopped reporting drive informations about this drives. I need drive read / write stats and similar things because this drives are in RAID 5 so I can't get them from task manager. 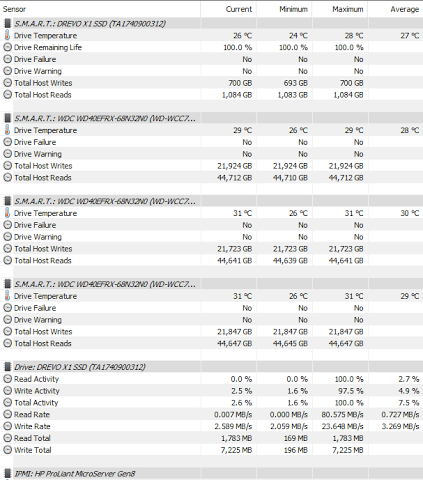 Hwinfo only shows me SMART informations but not the Drive: section. It works with an other disk I have installed, Drevo SSD 64gb where I have installed Windows Server 2016. I have also tried to rollback to older versions, reinstalling windows server and installing beta version of hwinfo but it didn't solved the problem. Is it possible that some updates in the system have caused this (rather than a new HWiNFO version) ? Well, it seems this is a problem in the system - it's doesn't expose the require information. If this was available earlier you will need to check what changed in the system. Maybe updated storage drivers ? I just did OS updates, drivers are old, it says 2006, I mean HDD drivers. And was this information previously in Task Manager too ? No, it has never been in task manager, that's why I installed HWiNFO on my server, because I wanted to know when disks were working and how much busy they are to better plan tasks. Similar informations are shown in resource monitor but it doesn't show singular disk informations. I tried to run HWiNFO as administrator and in compatibilty mode for Windows 8 and drive section showed up, however most of the information that should be there are missing. Sorry, but I cannot see the last 2 images you posted. It says "Forbidden". Reporting of Windows Server 2012 is due to the compatibility mode. Update: after some time now it is working again. I did nothing to HWinfo, so maybe a windows update fixed it. Yes, it looked like a Windows problem, so glad that it is resolved now.